422 fenugreek seeds recipes | Indian Methi seeds Recipes. Fenugreek or Methi Seeds, come from a plant that is known for its use as herb, vegetable and also spice. Methi seeds are brownish-yellow in colour and a bitter taste. They have been used in Indian cooking since centuries, not only due to the different flavor profile they provide to the food but also for its medicinal properties. It is a common ingredient in subzis, pickles and different types of masalas. They help in boosting the immune system and ensure good health as well. To crush methi seeds into a powder, it is first dry roasted to release maximum flavor and aroma out them. These roasted seeds are then used for making masalas for various curries. To make Sambhar, we first have to make the sambhar masala, which is made by roasted methi seeds, peppercorns, fennel and other seeds and then grinding them into a fine powder. Instead of adding methi seeds to the tempering, grinding them up gives a better taste to Matki aur Palak Curry. Methi seeds are widely used in south Indian curries. Buttermilk Rasam, a light curry best served with rice, uses methi seeds in the dry masala powder for a slight bitterness. Maharashtrian Papdi and Moong Dal subzi utilizes a lot of whole spices, including methi seeds, to make a spice powder for the subzi. This spice powder can be used with many other vegetables. Methi seeds are added to dosas and dhoklas and a lot of people wonder why. This is because all these recipes requires fermentation and methi seeds help in fermentation, that is, it fastens the process. not only can you make Sada dosa, the most basic, with butter but you can even make Poha Yellow Moong Dosa, Brown Rice Dosa and Sabudana Dosa. It also provides a lot of crispiness to the dosas. Methi seeds are also added to Khatta Dhokla batter and Idli Batter to help with the fermentation process. Other than this, it also provides a great base flavor to all these dishes. Methi seeds are the most known to make pickles, or fondly known as Achaar. It is the blend of spices that give pickle its flavor. Adding fenugreek seeds to pickles giver a slightly bitter yet nutty flavor which makes it all the more interesting to eat. It doesn’t matter with what you are making the pickle, methi seeds elevate it to a better, richer taste. With papaya, a Sweet and Sour Papaya Pickle can be made. If not sweet, you can try a pickle made with chillies, Hari Mirch Ka Achaar and make sure to use spicy chillies to really kick it up a notch. As you know, methi seeds are used in pickles. Just like that, you can use them in subzis that are a little achaari in taste. Achari Paneer has a slightly khatta flavor, which is delightful and soothing to the palate. Achari Dahi Bhindi is also similarly made. Here, dahi makes a beautiful combination with whole spices to give this subzi a great taste. These seeds are added to the tempering in various subzis to give more depth to the flavor. In Hyderabadi Bhaghara Baingan, the brinjals are cooked with dynamic tempering of seeds and curry leaves. Adding them to Gujarati Dal packs such a punch of flavor that not only Gujaratis, everyone loves this dal. Another way to use methi seeds is to add them to Mirchi Ka Salan. Methi seeds are really good for health. Not only do they help with indigestion, but is also great for diabetes. Mangalorean Tea is an herbal concoction of whole spices that boosts immunity and helps rejuvenate a person. It also helps in relieving cold and diarrhea. 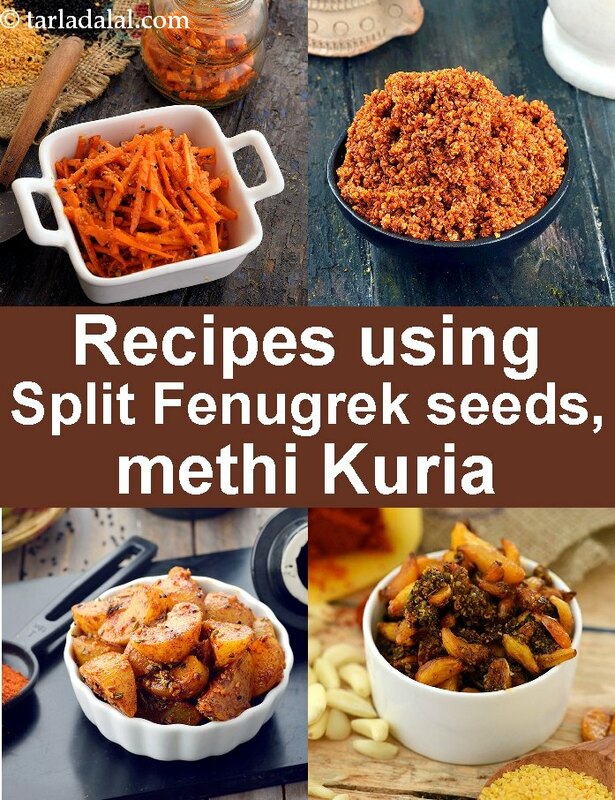 Hope you like this collection of 422 fenugreek seeds recipes | Indian Methi seeds Recipes..